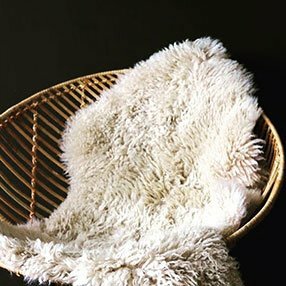 Collective’s tannery has an impressive choice of luxurious sheepskins selected for their varying textures, look and function. There is one to suite every taste and every personality – which one are you? For those of you that are ahead of the curve when it comes to home design, Silkies come pre-dyed in the latest colours for interiors; pale blue, rose quartz, mulberry, chocolate, ivory – the list goes on…. ‘Silkies’ is our own terminology to describe the beautiful, combed out silken feel of this collection. Not just a rug, Silkies can also be used to great effect to throw over furniture in the bedroom, living room, garden room etc. for that opulent look. You like to mix it up, blend the rough with the smooth and Curlies provide a wonderful contrast of texture alongside other interior soft furnishings, being Curly by name and curly by nature! Plunge your fingers deep into its wonderfully dense, sumptuous texture, ideal for sitting on for warmth and comfort. Also pre-dyed in an exciting multitude of colours. If you want to cocoon your little offspring or even a pampered pooch in love and luxury, the Shearling is the ultimate comforter. With a beautifully, baby-soft feel, they are perfect for lining a pushchair to keep your child warm and snug on cold wintery days out or even just to place on the floor at home for a kickabout. For your pets, line a cat or dog basket with a Shearling. Not only will it add a super stylish touch to your home, it will also be a treat for your furry friends to curl up in! So-called as they are provided by an Icelandic sheep breed with gorgeous long woolly coats. If you like your interiors in natural shades and textures but with a plush feel, then these sheepskins are the ultimate choice. None of these hides are pre-dyed but come in an array of natural colours. Ideal as a rug or a throw. If you are sitting outside on a chilly evening, using it to line your chair, will keep you snug as a bug! Of all your senses, your sense of touch is the most finely attuned, and you feel compelled to purchase your soft furnishing by the way they feel, first. You’ll be drawn to the Tibetan sheepskins because they are extremely soft. With a luxurious fibre of over 4 inches in length, they will accessorize any room with unique texture and style. The newest style of hides on the market, Tibetans offer a soft, silky layered texture that is hard to achieve with any other product. These hides come from a breed of sheep that are small, with long curly hair, rather like a poodle, but even more soft and silky!